Economic theorist (and man widely worshiped by many capitalists) Adam Smith apparently thought it reasonable for the rich to contribute more than their “fair share” — whatever that means — to society. 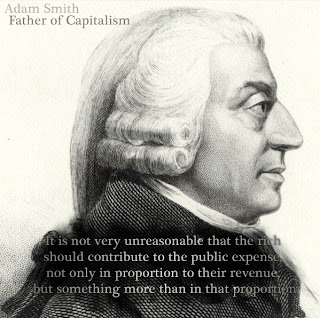 You’ll find the quote below in An inquiry into the nature and causes of the wealth of nations, Volume 3. He doesn’t suggest an income tax or anything like that. But he does seem to indicate that those of us who make more should, perhaps, be expected to contribute more.